Virgil Abloh has certainly become a fashion favourite in recent years. 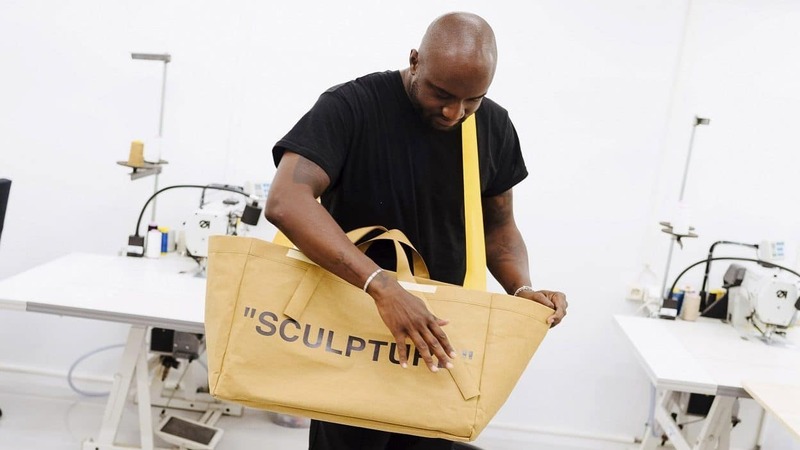 In addition to being appointed menswear artistic director at Louis Vuitton, Abloh’s own streetwear label, Off-White, has garnered such a cult following that it’s quickly become one of the most commercially successful brands in recent years. As such, it’s no surprise that brands from Nike to Jimmy Choo, Longchamp, Byredo, Rimowa, Mr Porter and more have invited him for collaborative projects to date. With a joint appreciation for minimalistic and utilitarian designs, homeware giant, Ikea, has also tapped the creative star to co-design a special collection, this time based not around the wardrobe, but on homeware. With an aim to provide millennials with space-saving solutions through ‘statement pieces challenging tradition’, this partnership has been hot on everyone’s wish lists since its announcement back in 2017. Though the collection won’t launch until November 2019, both parties released teasers and sneak peeks over the past few years, and even hosted an exclusive pop-up during Paris Fashion Week SS19 (exclusive pieces sold have already been marked up and resold for five-digit price tags). Even so, no solid information regarding the exact range of prices was ever provided — until now, that is. The 'STILL LOADING' carpet comes in two sizes. The 'KEEP OFF' carpet comes in two sizes. 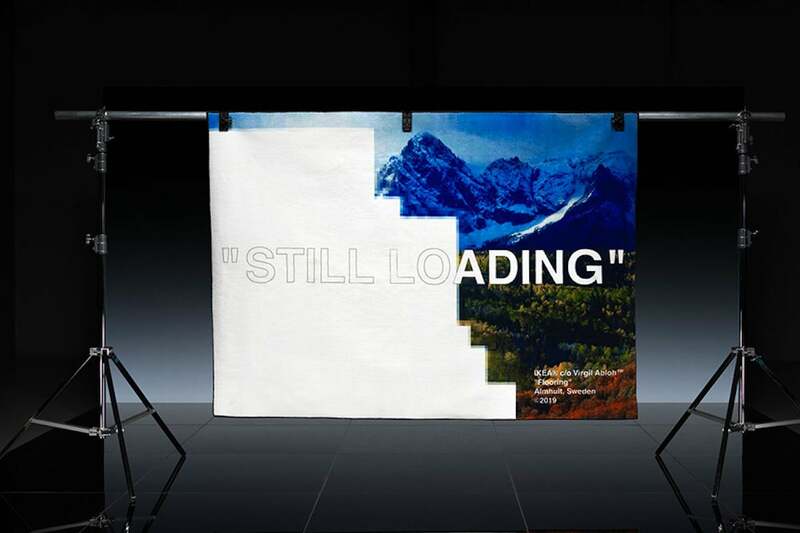 New information on the Off-White x Ikea collection has just emerged, revealing the product range of the collection that sits under three categories: carpets, furnitures and small pieces. 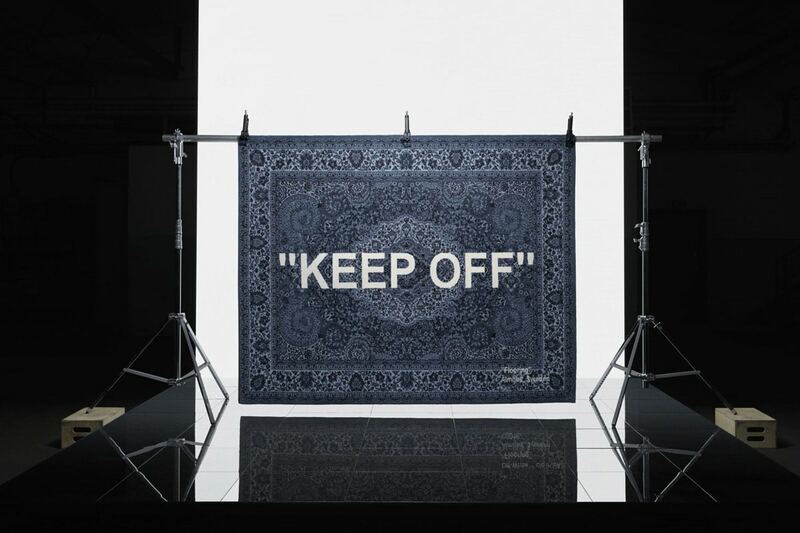 All products will feature Abloh’s signature quotation branding, but with very reasonable pricing. For carpets, six designs will be available to choose from, including the ‘WET GRASS’ (approx. 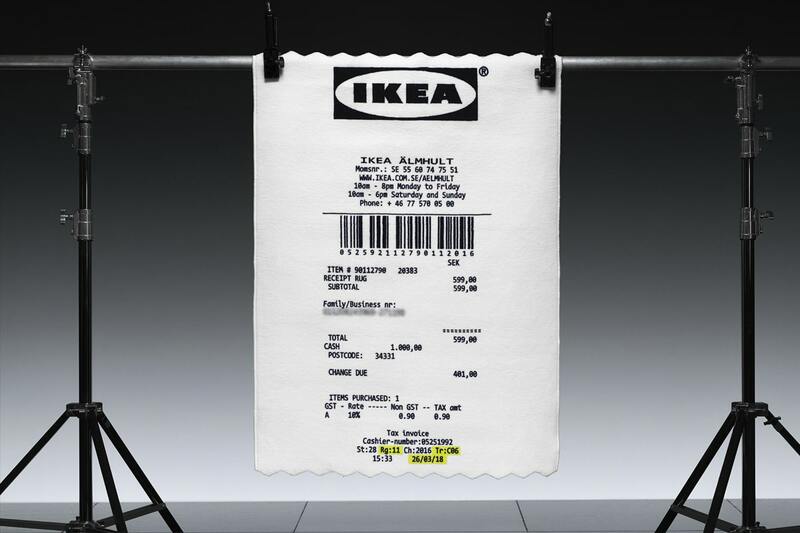 HK$2,061) and the Ikea receipt (approx. HK$531), along with ‘STILL LOADING’, ‘KEEP OFF’, ‘BLUE’ and ‘GREY’ that will come in two different sizes, with price tags that range from €79 (approx. HK$711) to €229 (approx. HK$2,061). 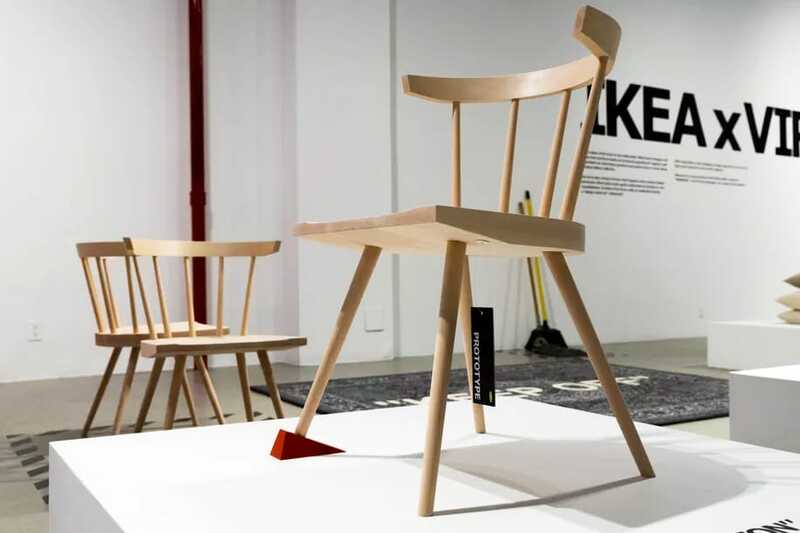 Prototype of a chair from Virgil Abloh’s Off-White x Ikea collection featuring a door stopper on one leg. For furniture, the collection will include a ‘DISPLAY YOUR ICON’ table (approx. HK$2,511), a chair (approx. HK$630), a chaise lounge (approx. HK$900), as well as a full-length distorting mirror (approx. HK$1,432) and a Mona Lisa light box (approx. HK$436). Small homeware pieces, meanwhile, include an all-white, faceless, ‘TEMPORARY’ clock (approx. HK$225) and a series of linen cushions with orange tags (approx. HK$90 to HK$900). 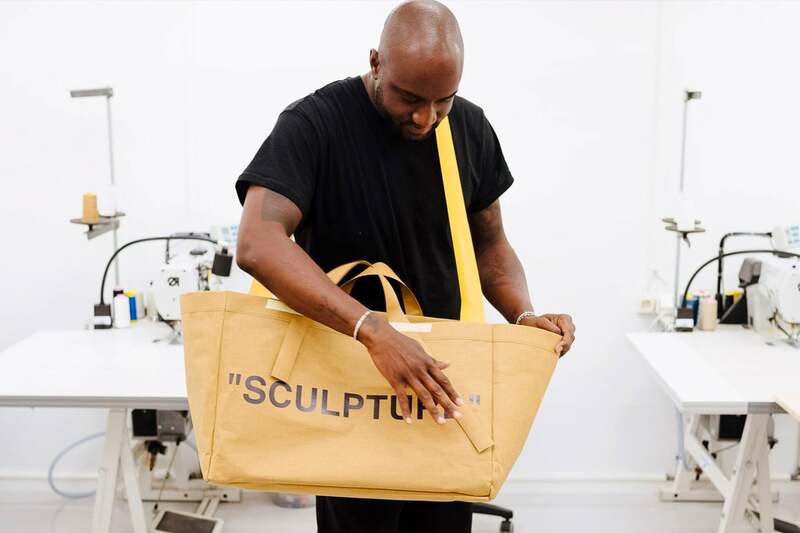 The ‘SCULPTURE’ shopper is Abloh’s take on Ikea’s iconic Frakta bag. The highlight of the collection, however, will undoubtedly be the ‘SCULPTURE’ shopping bag, which is a reinterpretation of Ikea’s Frakta bag and features a material that resembles a brown paper bag. This new Off-White version will be available in small (approx. HK$90) and large (approx. HK$117) sizes, and should be amongst the first items to fly off the shelves. There are also rumours in the air of more pop-up stores before the official global release, so keep an eye out for future announcements.